This is my fifth ACC Basketball Preview. To view my previous entries, click on “more” beside my username, then select profile. The Atlantic Coast Conference enters the 2016-2017 season having dominated the NCAA Tournament overall for a second consecutive year- and that was without a Louisville team that, in a questionable move, took itself out of the postseason picture. Also for the second year in a row, more than 20% of the top 100 recruits in the country are headed to the ACC. The conference adapted more quickly than any other to the shortened shot clock, with offensive efficiency suddenly replacing suffocating defense as the defining characteristic of the ACC's best teams, and that change resulted in an exciting new brand of basketball for fans. Unfortunately, the conference was hit harder by NBA Draft departures than it was a season ago, and the combination of a large graduating class and a coaching change at Georgia Tech means that there will now be two teams that struggle so much in nonconference play that they hurts the conference's chances for extra NCAA Tournament bids. The talent at the top of the conference means that placing four teams in the Elite 8 again seems possible, albeit unrealistic; still, if every team is eligible for postseason play, the ACC could place nine or possibly even ten teams in the NCAA Tournament field, and that includes the clear favorite to win the NCAA Championship. Joel Berry could find himself with as much shooting help as Marcus Paige had as a sophomore. Departures: Brice Johnson (17.0 ppg., 10.4 rpg., 1.5 bpg. ), Marcus Paige (12.6 ppg., 3.8 apg., 35.6% 3pt. ), and Joel James graduated. Although last season ended in heartbreak for the Tar Heels, reaching the National Championship game has to be considered a success; they did finish ahead of 349 other Division I teams. However, the graduation of Brice Johnson and Marcus Paige, the team’s two best players for each of the past two years, will leave Roy Williams with a very different challenge for the upcoming season. Marcus Paige was by far the most important player on the team during his sophomore and junior years, and, while Joel Berry did prove himself capable of taking over at point guard as a sophomore, Paige’s departure will still leave a big hole. The Tar Heels finished 263rd in the country in 3 point shooting percentage, and that includes a NCAA Tournament shooting performance that bordered on miraculous under the circumstances and, again, depended heavily on Paige. Berry (12.8 ppg., 3.8 apg., 1.5 spg., 38.2% 3pt.) did his best Paige impersonation through most of the year, serving as the team's best and most consistent outside threat and leading the team in assists and steals before becoming the MVP of the ACC Tournament. After serving as the third point guard for two years, Nate Britt should finally see an increase in playing time as a senior; while he has struggled with and even remade his jump shot in his time at North Carolina, he's dependable with the basketball and is a quick enough athlete to be successful attacking the basket and defending on the perimeter. 6-8, 193 pound junior Justin Jackson (12.2 ppg., 3.9 rpg.) likely slides into the backcourt with Berry. He's another solid passer and possesses a dangerous floater, but for the second year in a row he struggled to shoot from behind the arc until tournament time. This time, Jackson shot 47.4% in the NCAA Tournament after shooting just 20.7% over the first 34 games; Roy Williams needs him to shoot well all year if the Tar Heels are going to finish anywhere near the top of the ACC. Junior Theo Pinson started at small forward while Paige was injured early last season, and will return to the lineup now that Paige is gone. Pinson's an extremely athletic former top 10 recruit that hasn't provided much beyond strong defense and some creative passing to this point, as he has really struggled to put the ball in the basket. The rest of Williams' options on the perimeter are unproven young players. Sophomore Kenny Williams was a top 90 recruit a year ago and was considered one of the best perimeter shooters in his class, but he finished just 1 for 13 from behind the arc in limited minutes as a freshman. Seventh Woods is an incredibly athletic and explosive 6-2 shooting guard; he's a top 40 recruit, but he's much more likely to contribute defensively than offensively. Another top 40 recruit, 6-5 Brandon Robinson, should eventually contribute as a 3 and D wing, but there is a chance he will need to redshirt while he adds weight. The Tar Heels have been among the top 10 rebounding teams in the country each of the last two years, and those efforts were lead by Johnson. To come anywhere close to that this year, 6-9 senior Kennedy Meeks (9.2 ppg., 5.9 rpg.) must return to his sophomore form when he averaged 7.3 boards a game, and 6-10 freshman Tony Bradley will have to contribute on the boards immediately. Meeks was noticeably less assertive following a knee injury midway through last season, but that could have also been a result of how dominant of a presence Johnson became. Bradley is a top 25 recruit with long arms and soft hands; he should be able to rebound and score in the post if he's gotten strong enough, but athletically he more closely resembles Meeks than Johnson. Senior Isaiah Hicks (8.9 ppg., 4.6 rpg.) could start over Bradley, but he struggles to rebound and defend without getting into foul trouble. He's an explosive, slashing interior scorer, and would likely win his third sixth man of the year award if he comes off the bench again. Joel James' graduation is also important, because it really leaves Roy Williams with just three quality big men. Sophomore Luke Maye might receive a chance to contribute as a stretch 4, but if he isn't better then foul trouble or an injury will lead to smaller lineups with Pinson playing out of position at power forward. While the Tar Heels did struggle to shoot from behind the arc a season ago, they were nevertheless one of the more efficient offenses in the country, finishing 17th in overall field goal percentage and 3rd in assist to turnover ratio. Losing Johnson’s 61.4% shooting from the floor and Paige’s ability to create will likely cut into those numbers. While rebounding may hold steady, the frontcourt will have less depth, offensive punch, and rim protection. The possibility of NCAA sanctions may have had a modest impact on recruiting, but North Carolina should still have enough talent to find its way back into the NCAA Tournament; however, a return to the top of the ACC is likely a year or two away. Dec. 29 pre-conference update: Justin Jackson (17.5 ppg., 40.7% 3pt.) has emerged not only as the complimentary perimeter scorer that Joel Berry needed, but as a likely All-Conference player and first round pick while Kenny Williams (6.7 ppg., 40%) and Luke Maye (40% 3pt.) have shaken off forgettable freshman years to provide additional perimeter weapons. Kennedy Meeks (13.1 ppg., 9.2 rpg.) has had a return to form in the paint, so scoring isn't going to be the problem it could have been. On the other hand, much has been made of the Tar Heels' offensive rebounding, but those numbers have to be taken with a grain of salt; Tony Bradley averaged 6 offensive rebounds per game (a huge number) against Chattanooga, Hawaii, Chaminade, and Radford – teams that he could throw his weight around against – but he managed just one per game against the three teams (Wisconsin, Indiana, and Kentucky) the team has faced with ACC caliber frontcourts (Tennessee and Oklahoma St. are power conference teams with drastically undersized frontcourts). The numbers are only slightly less exaggerated for Kennedy Meeks. The Tar Heels won't have a problem on the boards, but they're not going to destroy people either. While a return to the title game still seems unlikely, North Carolina should again be a contender in the ACC and a dangerous matchup in the NCAA Tournament. Feb. 3 update: Even though Kenny Williams has digressed in conference play, the Tar Heels have seemingly answered all of the question marks that existed before the season. Theo Pinson's return from a foot injury is a big reason why; when he's been on the court, he's shown the passing ability he displayed last season as well as the rebounding he had shown as a freshman. Pinson's also a high end perimeter defender, and, for maybe the first time in his career, he's shooting fairly well. He does have to get healthy and play twenty plus minutes a game, but with Pinson now looking like the top 10 recruit he was coming out of high school, and with the team suddenly shooting reasonably well behind the arc (a thoroughly respectable 69th overall in 3pt.%) and continuing to dominate the boards (1st in rebounding margin- I was wrong) at both ends of the floor as a team, the Tar Heels are a Final Four contender once more. The NBA would probably like to see Dwayne Bacon shoot better as a sophomore. Departures: Malik Beasley (15.6 ppg., 5.3 rpg., 38.7% 3pt.) was a first round draft pick; Devon Bookert (9.5 ppg., 39.1% 3pt. ), Boris Bojanovsky (6.1 ppg., 4.4 rpg., 1.7 bpg. ), and Montay Brandon graduated; Benji Bell (42.6% 3pt.) transferred. 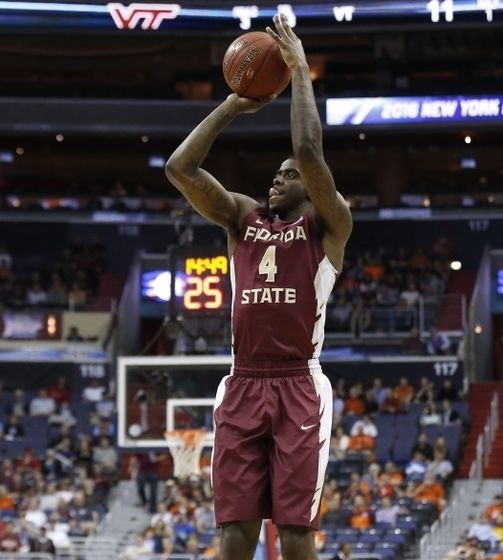 Florida State appeared in the NIT for the 3rd time in 4 years last season, which is enough to keep head coach Leonard Hamilton off the hot seat but was actually a huge disappointment relative to their talent level and preseason expectations. The Seminoles will again have a loaded roster this season, and will attempt to return to the NCAA Tournament for the first time since 2012. Florida State always has a problem with offensive efficiency due to an offense that depends primarily on players creating their own shot. They finished 183rd with a better than 1 to 1 ratio last year, which is actually a relatively strong showing for a Leonard Hamilton team (up from 303rd two years ago). 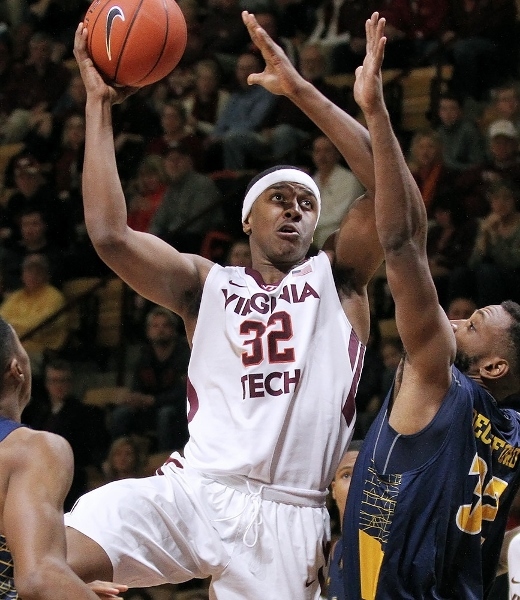 Part of that improvement came as Xavier Rathan-Mayes (11.8 ppg., 4.4 apg. ), a combo guard that has been running the offense for two years, cut down on his turnovers as a sophomore. He actually started the year playing well with a high assist rate, but he lost confidence as the year went on and ended the season with remarkably similar overall numbers to his freshman year. Beasley's departure may actually help him in that regard, as he will likely become the number two offensive option. There may also be less pressure on him as a ball handler due to the addition of two highly regarded freshman point guards, one of whom could start. 6-4 Trent Forrest, a top 50 recruit, is an athletic slasher, while 6-0 C.J. Walker, a top 80 recruit, is a more traditional point guard that may also be able to help as a perimeter shooter. Sophomore Dwayne Bacon (15.8 ppg., 5.8 rpg.) likely would have been a 1st round pick had he entered the draft, but he decided to return in hopes of playing in the NCAA Tournament. He will again be asked to play out of position at small forward, where his scoring load will likely increase after Beasley's departure. Terance Mann, a top 90 recruit a year ago, could receive more opportunities as a sophomore after shooting extremely well inside the arc as a freshman. As great as Leonard Hamilton has been at recruiting during his tenure at Florida State, Jonathan Isaac is the highest rated prospect he has ever signed. 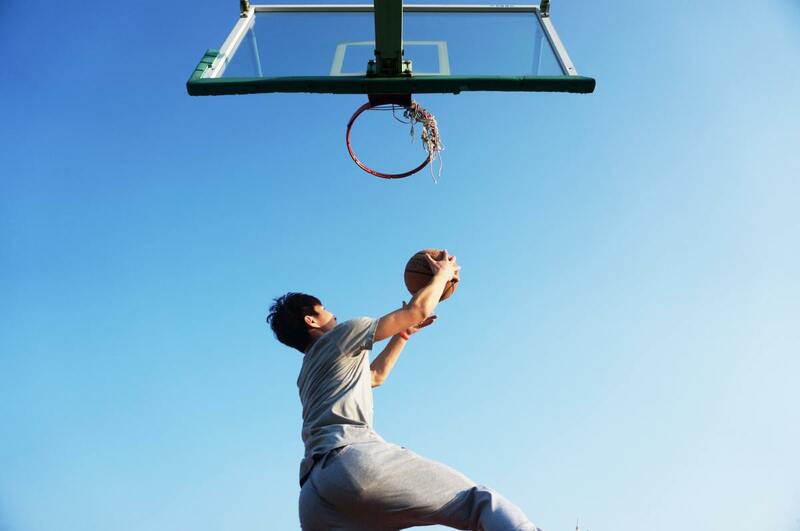 A top 10 recruit, Isaac is athletic, long armed, and 6-11. A very thin work in progress that can't defend the post, he will almost certainly be asked to play out of position at power forward, but he should rebound and fit nicely into the offense with his ability to create his own midrange shot. Isaac will certainly be a huge step up from Montay Brandon, who was even more out of place at power forward and had a bizarrely ineffective senior season despite playing nearly 20 minutes per game. 6-9 senior Jarquez Smith will be an option at center; he's hardly a dominating post presence, but he did manage a block a game in 14.4 minutes. 6-8 sophomore Phil Cofer, coming off a medical redshirt, will likely see minutes as well. The best case scenario in the post would be if 7-4 Christ Koumadje, an extremely mobile and athletic project, were ready to contribute as a shotblocker and rebounder as a sophomore. Shot blocking was a key to Leonard Hamilton's most successful teams, and Koumadje is the best potential source for it. Florida State neither shoots (195th in 3pt% before losing their three best shooters) nor defends (271st in 3pt.% defense) the 3, which is even more of a problem now with the changes in play that resulted from the shortened shot clock, and the offense is stagnant and breeds inefficiency. There is so much talent and athleticism that the Seminoles will remain competitive, but anything beyond an occasional NCAA appearance is unlikely unless Leonard Hamilton makes dramatic changes to his team's style of play. Dec. 22 pre-conference update: The Seminoles have been nothing short of dominant in their non-conference schedule. Statistically, this looks like one of the best teams Leonard Hamilton has ever put on the floor; they defend well (20th in fg% defense), perhaps more importantly for the team's progress they defend the 3 well (26th), and they take care of the basketball (52nd in assist to turnover ratio) – it really looks like a completely different team. Jonathan Isaac (13.8 ppg., 7.3 rpg., 41.9% 3pt.) is certainly an important part of that; he's an almost certain one and done that has already developed into a high end 3 point shooter at 6-11. Xavier Rathan-Mayes, Trent Forrest, and CJ Walker all have better than 2 to 1 assist to turnover ratios, Dwayne Bacon 16.9 ppg. on 35.8% 3pt.) is shooting better, and Hamilton may have found another effective 3 point specialist in PJ Savoy (43.6%). It is still really hard to believe those numbers after the team has done none of those things well for so long, but the first few weeks of the ACC season will show just how far the Seminoles may have progressed. Quentin Snider cannot get hurt. He can, but it would be really bad. Departures: Damion Lee (15.9 ppg., 3.9 rpg.) and Trey Lewis (11.3 ppg., 35.1% 3pt.) graduated; Chinanu Onuaku (9.9 ppg., 8.5 rpg., 2.0 bpg.) was a second round draft pick. Despite the lure what would have been at least a 4 seed in the NCAA Tournament, Louisville made themselves ineligible for the postseason last year to minimize the long term effects NCAA sanctions over a recruiting scandal would have on the program. It was a questionable move that essentially punished two graduate transfers that chose the program specifically to play in the NCAA Tournament; while it should probably lead to the creation of its own NCAA rule, it will likely allow the team to return to the NCAA Tournament this year without losing any recruits in the process. For the second year in a row, a great deal of responsibility will be placed on the shoulders of Quentin Snider (9.4 ppg., 3.5 apg., 40.4% 3pt.). The offense will be very much in his hands, and he will be operating virtually without a safety net. Snider posted a nearly 3 to 1 assist to turnover ratio as a sophomore, and he's the team's best returning perimeter shooter; he should be a star by the end of the season. 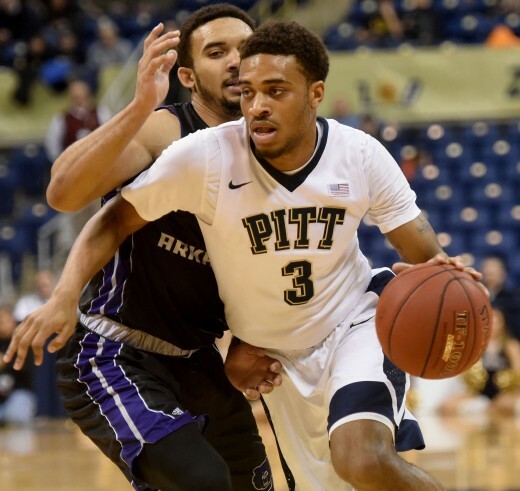 Penn graduate transfer Tony Hicks (13.2 ppg., 37.1% 3pt. at Penn two years ago) will be the closest thing to a backup Pitino has available; while he did lead Penn in scoring his last two years there, he had a negative assist to turnover ratio as a junior, so the Cardinals could be in trouble if Snider were to suffer an injury. The Cardinals are brimming with athleticism and depth everywhere else. Donovan Mitchell (7.4 ppg.) will take over at shooting guard after oozing potential off the bench as a freshman. He's an explosive, imposing physical presence that attacks the offensive glass and gives instant energy to Pitino's press whenever he enters the game. He didn't shoot particularly well as a freshman, but his high school stats indicate he's capable of doing better. Sophomore Deng Adel, a top 30 prospect a year ago, missed a third of the season with a leg injury, but did get extended minutes over the last five games during which he shot reasonably well and flashed potential of his own. Another long, athletic top 30 prospect, 6-7 freshman V.J. King, will provide depth; he may be more skilled offensively than either Mitchell or Adel. Even without Onuaku, the Cardinals have a ridiculous amount of talent in the frontcourt- so much so that someone really should have transferred for more playing time. There are 5 players that would be starting, if not starring, for most Division I teams, 3 that are legitimate NBA prospects, and none that can reasonably play any position other than power forward and center. 6-10 redshirt junior Mangok Mathiang (7.1 ppg., 5.7 rpg., 1.2 bpg.) was becoming more and more like Onuaku before a foot injury sidelined him for the season after 10 games. Sophomore Raymond Spalding (5.6 ppg., 4.3 rpg.) is another high end NBA prospect; he's 6-10, long and extremely athletic, shoots a high percentage, and finished 3rd on the team in both rebounding and steals in just 17.5 minutes per game. Junior Anais Mahmoud is 7-0, remarkably agile, a creative passer, and the teams best per minute shot blocker (1.4 bpg. In 13.7 minutes). 6-9 junior Jaylen Johnson started most of the season at power forward, although he was the least productive player per minute in most categories. Junior Matz Stockman is 7-0, a thoroughly respectable player, and should probably go ahead and redshirt. 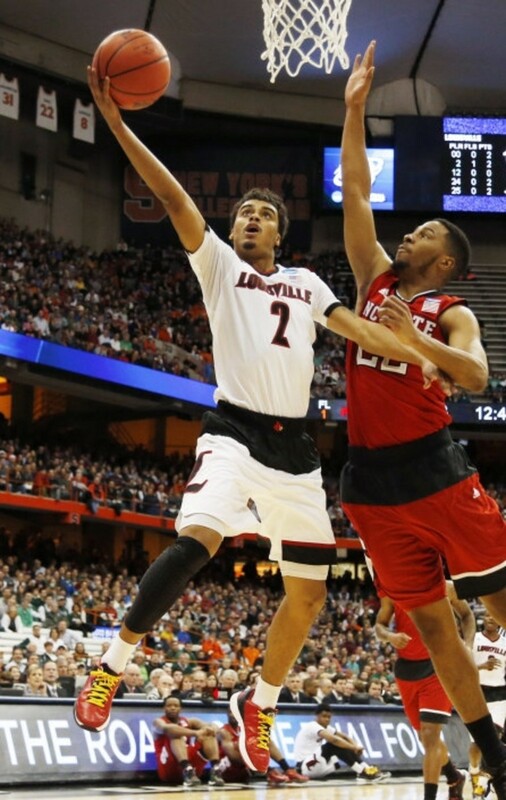 Louisville could reasonably become the best defensive team in the country. They finished last season 9th in field goal percentage defense, 53rd in 3 point percentage defense, 27th in rebounding margin, 36th in blocks, and 62nd in steals. Every one of those numbers could go up as the team becomes bigger and more athletic on the perimeter and their incredibly long and athletic frontcourt continues to develop to their considerable potential. Offensive efficiency could again be a mild issue (the Cardinals were 98th in assist to turnover ratio last season) with just one player with point guard skills available, and there's no telling how well they might shoot from the perimeter, but the Cardinals are going to physically overwhelm people at times. They should be right back in the mix for a deep run in the NCAA Tournament. Dec. 22 pre-conference update: Louisville is as advertised defensively and on the boards (5th in fg% defense, 20th in 3pt.% defense, 10th in rebounding margin), and they even taken reasonably good care of the basketball (49th in assist to turnover ratio) – but this team cannot shoot (216th in fg%, 250 in 3pt.%). Quentin Snider (35.1% overall) and Donovan Mitchell (29.9% 3pt.) are both shooting horribly, and there really aren't any other options (Adel and King aren't able to create their own shots) beyond pressing and scoring off turnovers and feeding the post in the halfcourt as often as possible. The Cardinals are still a dangerous team because of all of their length and athleticism, but their games are going to be ugly to watch, and at some point they just won't be able to score enough points. Feb. 3 update: Quentin Snyder's injury has been a blessing in disguise for the Cardinals, as having the ball in his hands more often has ignited Donovan Mitchell's shooting touch (he's hit 12 of his last 18 3's) to the point that he is suddenly shooting up draft boards in the process. Dave Levitch and Ryan McMahon have also proven serviceable as spot up shooters with increased minutes, and the result is that a Louisville team that couldn't shoot suddenly can a little. The Cardinals are now set to become a very real Final Four threat when Snyder returns. Bonzi Colson will seriously stuff the stat sheet with starter's minutes. Departures: Demetrius Jackson (15.8 ppg., 4.7 apg.) was a second round draft pick; Zach Auguste (14.0 ppg., 10.7 rpg.) graduated. The Irish reached the Elite 8 for the second year in a row last year- and, for the second year in a row, they lost their two best players following the season. 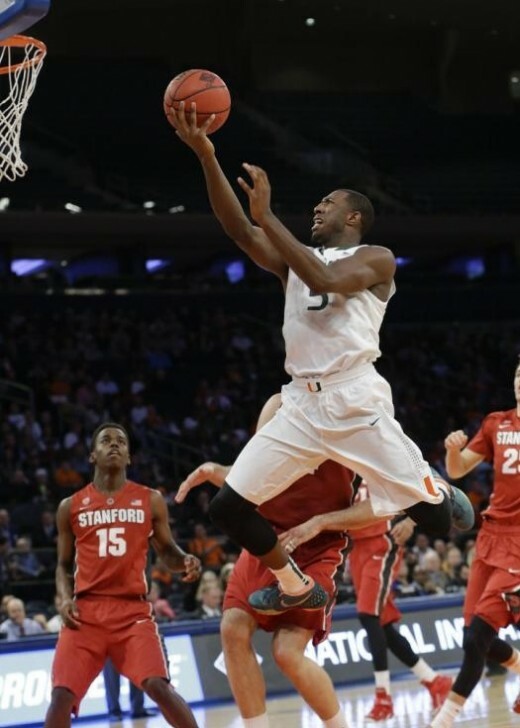 Demetrius Jackson proved more than capable of taking over the full workload after Jerian Grant's graduation- although he had to play 37 minutes a game (discounting an injury shortened game against BC) for the team to retain it's level of play. There is no obvious future NBA player around to take over this season, so offense is likely to become a bit more interesting. 6-3 freshman Temple Gibbs, a top 80 recruit, will get a look, but he's a combo guard that is still learning to play as a distributor. 6-1 junior Matt Farrell started several games beside Jackson in the NCAA Tournament; while he is a smart player that understands what needs to happen for the offense to be successful, he's limited athletically and can't get off his shot quickly. The most interesting possibility is 6-6 sophomore Rex Pflueger, a top 100 recruit last year that gained notoriety after hitting a last second shot against Stephen F. Austin to put the Irish in the Sweet 16. Pflueger served primarily as a defensive specialist as a freshman and didn't look for his shot very often, but he had a reputation as a strong shooter coming out of high school; more importantly, he's an excellent passer that finished with a nearly 4 to 1 assist to turnover ratio with limited opportunities. Regardless of who ends up at point guard, Steve Vasturia (11.4 ppg., 34.4% 3pt. ), who averaged over 36 minutes a game at shooting guard as a sophomore, will likely see his scoring load increase, and he'll be even more important as a secondary ballhandler. He's a skilled and deceptively athletic player, but his shooting did suffer with the increased minutes. Senior V.J. Beachum (12 ppg., 3.9 rpg.) should emerge as the go to scorer after hitting 44.4% of his 3's as a junior. He has slowly become more assertive defensively and on the boards, and last season he started attacking the basket when defenders closed hard on him at the 3 point line. Brey doesn't have a clear replacement for Auguste either. At 6-5, junior Bonzi Colson (11.1 ppg., 6.7 rpg.) is a bullish low post scorer, rebounder and defender thanks to his long arms and strength, and he led the team in steals and blocks a season ago; he could make a case for an all conference team, but there is only so much one man can do. After his frame filled out as a freshman, 6-8 Matt Ryan (37.4% 3pt.) can really only play as a stretch four, and with his lack of speed and agility he isn't going to help much defensively or on the boards. Still, he will definitely knock down shots. 6-10, 255 pound junior Martinas Geben can at least provide the size Brey usually has available in the post. Notre Dame's offensive efficiency fell off slightly after Jerian Grant's departure, but it was still a strength as the team finished 31st in field goal percentage, 46th in 3pt. percentage, and 43rd in assist to turnover ratio. Those numbers should tumble once more without Jackson, although Mike Brey's well coached motion offense will always allow the team to score. More concerning is the team's defense; in a tradeoff that may need to be altered because of the way the college game has evolved, Notre Dame rarely defends the 3 point shot well (they were 297th in 3pt.% defense last year), and that could get even worse as the team becomes less athletic. Auguste was also a solid on the ball defender in the post, and his loss means that the overall field goal % defense (155th a season ago) will suffer as well. Although the Irish only lost two major contributors, losing their two best players two years in a row without adding any elite, immediately productive replacements may mean a brief rebuilding effort for Mike Brey's Irish. Dec. 29 pre-conference update: This may still end up as a rebuilding year for Notre Dame, but if so it will only be because of how loaded the conference is. The Irish performed extremely well in the non-conference, and they've experienced no noticeable falloff at the offensive end (they are currently 1st in assist to turnover ratio and 18th in 3pt.%). That is largely due to a dramatically improved Matt Farrell (13.2 ppg., 5.8 apg., 37.7% 3pt.) who is running the offense with confidence and playing without hesitation. He seems like a completely different player; the release on his jump shot is quicker, and his physical movements are more decisive and aggressive than a season ago (his strength and conditioning has visibly improved as well). With the exception of Bonzi Colson (16.2 ppg., 10.2 rpg., 1.3 spg., 1.4 bpg. ), he has been the team's best player at times. Even the team's defensive numbers have been impressive (54th in fg% defense), although the Irish are still likely to have issues defensively in conference play, particularly in the post. Martinas Geben has been helpful on the boards, but he's extremely foul prone and, along with Matt Ryan, is going to have trouble against more athletic big men. There will be nights when the Irish simply outscore some of the offensively challenged ACC teams; on others, they might find themselves physically overwhelmed. Regardless, another NCAA Tournament appearance is again a very real possibility. March 6 Postseason Update: The Irish will enter the postseason hot, having won five of six with the only loss at Louiville in the regular season finale. They are again one of the most efficient offenses in college basketball, currently ranked 31st in 3pt. % and 2nd in assist to turnover ratio. Moving Rex Pfleuger into the starting lineup in place of a limited Martinas Geben has made the team even more vulnerable on the boards (251st in rebounding margin), but it has only made the team more dangerous at the offensive end and has helped the team defend the three point arc (a respectable 109th in 3pt.% defense), which has traditionally been a weakness. While they are vulnerable to larger, skilled frontcourts and off shooting nights, Notre Dame is again in position for an extended NCAA Tournament run. Departures: Brandon Ingram (17.3 ppg., 6.8 rpg., 1.4 bpg. 41% 3pt.) was the 2nd pick in the NBA Draft; Marshall Plumlee (8.3 ppg., 8.6 rpg., 1.6 bpg.) finally graduated; Derryck Thornton (7.1 ppg.) decided to transfer. Considering the talent the Blue Devils lost following their National Title in 2015 (and an in-season injury they couldn't afford), last year’s Sweet 16 appearance was quite an accomplishment. With the nation's premiere recruiting class and the surprising return of Grayson Allen, expectations will once again be incredibly high for Mike Krzyzewski’s Blue Devils. After barely playing as a freshman, Allen (21.6 ppg., 4.6 rpg., 3.5 apg., 41.7% 3pt.) was named a third team All-American and first team All-ACC player after shouldering an incredible load as both the team’s point guard and leading scorer as a sophomore. He may play off the ball at times as a junior, but he will likely remain the team’s most dangerous offensive option, particularly as the shot clock runs down. 6-4 freshman Frank Jackson, a top 15 recruit nationally, could push Allen off the ball- or start at shooting guard, or be the third guard off the bench. Jackson is very similar to Allen in that he’s an athletic and aggressive scorer capable of running a team, although he may not be quite the shooter that Allen is just yet. Krzyzewski also still has hard working, ultra dependable senior Matt Jones (10.4 ppg., 41.5% 3pt.) available to provide experience at both wing positions. His defense, spot up shooting, and experience will at least give him a chance to start as a senior. Despite some inconsistency shooting the basketball, Luke Kennard (11.8 ppg., 3.6 rpg.) transitioned smoothly into Duke’s offense as a freshman; his minutes could decrease as a sophomore with so much depth, but he'll be an important part of the program moving forward. Even with Allen’s return, the biggest story for the Blue Devils upcoming season will be the arrival of the top 2 recruits in the country - a recruiting coup that even John Calipari has to be jealous of. 6-10, 230 pound power forward Harry Giles is the top recruit; he’s as skilled and athletic as you would expect, including the ability to create his own smooth midrange jump shot. His draft stock and minutes may take a hit after having his third knee surgery in three years in early October, but he should be ready to contribute for the Blue Devils by the time ACC play begins. 6-9, 203 pound small forward Jayson Tatum is the number two recruit; while he doesn’t have Giles’ size, he’s an even more explosive and well rounded scorer and is a solid passer as well. Mike Krzyzewski will have a tough decision to make at center, where he added a fourth top 15 recruit (and a third projected top 10 prospect in next year's draft) in Marquies Bolden late in the spring to supplement redshirt senior Amile Jefferson. Jefferson (11.4 ppg., 10.3 rpg.) was averaging a double double through 9 games before a foot injury shelved him for the year, and he provides the additional advantage of not requiring the ball at the offensive end to be effective. At 6-11, 240 pounds, Bolden is bigger and stronger than Jefferson and has more upside, but he hasn't shown the effort defensively Jefferson provides. Chase Jeter, a top ten recruit that struggled to adjust as a freshman, should be much better prepared physically when called upon and will be the likely beneficiary of Giles' potential minute restrictions at power forward. It’s hard not to overstate how good this Duke team can be. With 8 of 10 potential rotation players former McDonald's All-Americans (Giles was injured as a senior so he wasn't considered), it may be the most athletic, talented team Mike Krzyzewski has ever or will ever coach on the collegiate level, which is clearly saying a lot. If Giles and Tatum adjust quickly and develop into the top 5 picks they're projected to be, the trio they form with Allen could be among the best there has been in college basketball in quite some time. Defense and rebounding were limiting factors for the Blue Devils a year ago (they finished 234th in field goal percentage defense and 210th in rebounding margin with Marshall Plumlee essentially left to fight the good fight by himself in the post), but they suddenly have so much size and athleticism that even that should become a strength. With one of the two most successful coaches in the history of college basketball leading the way, it would almost be shocking if Duke doesn’t win another title this season. Dec. 22 pre-conference update: Despite not having its entire roster available at any time, Duke performed extremely well throughout their non-conference schedule. With the extra playing time, Luke Kennard has been the breakout star, averaging 20.4 ppg. and 5.9 rpg. while shooting 52% overall and 42.7% behind the arc. The most surprising development has been the team’s defense; the Blue Devils are 46th in field goal % defense and 23rd in rebound margin, and that was with a still physically overmatched Chase Jeter as the only size to compliment Amile Jefferson. With Tatum, Bolden, and eventually Giles becoming available to help, Duke’s defense could be stifling in conference play. Tatum has been great thus far, but Bolden has struggled; if he isn’t able to stay in the rotation, he could become more than a one and done. March 6 Postseason Update: The Blue Devils have not developed the depth they were expected to have, but they are still one of the most talented teams in the country, and Mike Krzyzewski has erred on the side of caution with injuries and should have everyone available for the NCAA Tournament. Harry Giles is clearly at least a season away from regaining the explosion that made him the number 1 recruit in his class, but his actual production (10.8 points, 10.3 rebounds, and 1.3 blocks per 30 minutes) in limited minutes is very similar to what the team gets from Amile Jefferson. With Frank Jackson coming on late, Duke has as many weapons as anyone and should still has to be considered a National Title contender. Tony Bennett doesn't compromise on discipline. Departures: Malcolm Brogdon (18.2 ppg., 4.1 rpg., 3.1 apg., 39.1% 3pt. ), Anthony Gill (13.8 ppg., 6.1 rpg. ), and Mike Tobey (7.3 ppg., 4.4 rpg.) graduated. 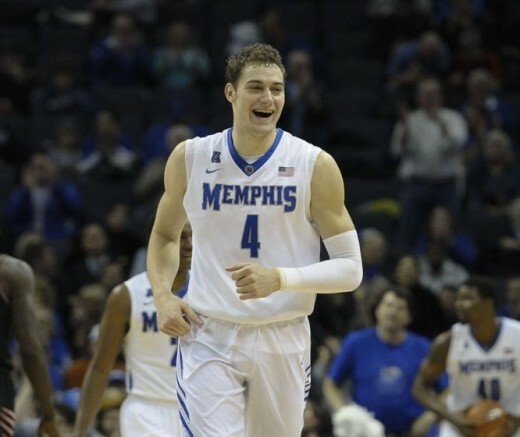 Transfer Austin Nichols was released from the team. Last season the Cavaliers reached the Elite 8 for the first time since 1995, and, while they have since lost their best perimeter player and their best post player for the third straight year, this will be the first year Tony Bennett's success at Virginia will be fully reflected in his incoming talent. Virginia's success last season was a bit of a surprise in that it came largely due to a remarkably efficient offense. The Cavaliers went from 131st in the country in 3 point percentage to 10th, 67th to 7th in overall field goal percentage, and, while they haven't had a turnover problem for years, they hit a new high by finishing 5th in the country in assist to turnover ratio. Senior London Perrantes (11.0 ppg., 4.4 apg., 48.8% 3pt. ), who has taken tremendous care of the basketball since his freshman year, was a big part of the improvement, emerging as one of the most dangerous perimeter shooters in the country. With Brogdon's graduation, he likely becomes the team's go-to scorer, at least early in the season. That role could eventually go to Kyle Guy who, as a top 25 prospect, is the most highly rated high school player Bennett has signed; he's a smart combo guard that's considered the best shooter in his class, although physical strength could be a limiting factor for him during his freshman year. Perrantes played off the ball at times last season, with junior Devon Hall running the offense to free him to look for his shot. While Hall doesn't have much confidence in his own shot, he's efficient with the basketball and a good passer; more importantly, he's physically active at both ends of the floor, and, at 6-5, 210 pounds, he may replace Brogdon as the team's best wing defender. He will likely continue to start and defend the small forward position. That lineup is hardly set in stone, and Bennett will have plenty of talent to choose from. Two juniors, 6-5 Marial Shayok (43.6% 3pt.) and 6-4 Darius Thompson (39.0% 3pt. ), will be in the mix for perimeter minutes as well; both are strong defenders that shot the ball well a season ago. Bennett also has 6-5 point guard Ty Jerome, a top 60 prospect that's well regarded as both a shooter and passer. After the graduation of Gill and Tobey the frontcourt is suddenly very young, but the athleticism and potential is increasing. Redshirt freshman Mamadi Diakite was a top 40 recruit in last year's class after graduating high school a year early; he likely added more strength and developed his game more by redshirting than he would have playing his senior year of high school (although actually playing after leaving high school early has had mixed results). At 6-9, Diakite is an explosive athlete that rebounds out of his area and blocks shots instinctively; he could be an immediately imposing presence, and should start eventually. 6-7 junior Isaiah Wilkins (4.6 ppg., 4.1 bpg.) hasn't scored or rebounded particularly well to this point, but he's an active and athletic defender with the potential to do more. If Bennett needs a wider body, 6-11 sophomore Jack Salt and 6-7 sophomore Jarred Reuter are still available. After having dominated the category for years, UVA fell to 90th in the country in field goal percentage defense last season due to the increased 3pt. shooting in the ACC (they finished 182nd in 3pt.% defense, a vulnerability of the pack line defense). Still, the defense will be stout, and with multiple players with point guard skills and the addition of even more quality perimeter shooting there is no reason to think that offensive efficiency will drop off significantly from last year's impressive numbers. Paired with a solid returning cast that includes a potential star senior point guard, Tony Bennett's best incoming class so far should provide Virginia with the opportunity to reach the Elite 8 for the second consecutive year. Dec. 22 pre-conference update: Even without the dismissed Austin Nichols, Virginia’s defense has been stifling (4th in the country in field goal % defense), and offensive efficiency has stayed close to last year’s numbers. Rebounding has been a strength as well (15th in rebounding margin), but that could become an issue in conference play; the Cavaliers haven’t faced many imposing frontcourts, and 6-7 Jared Reuter has been the team’s best per minute rebounder to this point. Mamadi Diakite has flashed potential as a shot blocker and scorer, but he isn’t strong enough to be a great rebounder just yet. In the backcourt, Kyle Guy has been as good as advertised offensively (9.4 ppg. In 17.5 mpg., 60% 3pt. ), but his minutes have been limited due to the defensive abilities of the larger more athletic perimeter players available. However, if Virginia needs scoring, they know where to get it. Even if rebounding becomes an issue, Virginia should be Duke’s strongest contender with all of the things they do well. Feb. 3 update: With so much perimeter talent, including a suddenly surging Ty Jerome, the Cavaliers are now playing with four perimeter players for big minutes each game, with sturdy but still 6-5 Devon Hall holding up remarkably well as an undersized power forward in those groups. While that should make UVA vulnerable to teams with more frontcourt talent, Tony Bennett's pack line defense has remained effective (currently 11th in FG% defense and 51st in rebounding margin), and the Cavaliers are at least headed for a strong showing in ACC play once more. March 6 Postseason Update: A complete lack of an interior scoring presence and the absence of a true go to scorer (leading scorer London Perrantes averages just 12.8 points per game) could again limit the Cavs in the postseason – but this is the same pack line defense that Butler used to reach two title games without much offense, so they still shouldn't be written off as Final Four contenders. Even if this isn't their year, the talent level continues to improve for Tony Bennett, who will only lose Perrantes to graduation. March 14 NCAA Tournament Update: UNCW is a popular pick to upset UVA in the first round, and it really doesn't make sense. UNCW wins games at the offensive end of the floor, and UVA disrupts everyone at that end of the floor. More importantly, UNCW is one of the worst defensive teams in the country (333rd in fg% defense against a weak schedule), and UVA is only getting better at the offensive end of the floor after moving to a 4 guard lineup for significant portions of each game. The game should be a blowout. The ACC's most pleasant surprise last year. Departures: Jalen Hudson (8.4 ppg., 34.6% 3pt.) transferred to Florida; Kerry Blackshear and Johnny Hamilton will be medical redshirts. Virginia Tech was struggling through a protracted losing streak before a couple of changes in early February helped facilitate a 5 game winning streak to close out the conference schedule and a win in both the ACC and NIT tournaments. With only one significant personnel loss from what was a very young roster that should mature, Buzz Williams has the Hokies in position to contend for an NCAA Tournament appearance in just his third year. One of the changes that led to the late season turnaround was settling on Justin Robinson at point guard. He didn't necessarily excel as a distributor, but everyone settled into their roles and Robinson's play did improve, with his scoring increasing (9.9 ppg.) and his shooting improving (43.3% 3pt.) over the team's last 13 games. He's quick off the dribble, and did finish with a nearly 2 to 1 assist to turnover ratio. Senior Devin Wilson doesn't provide much offense as his backup, but he is a respectable game manager and a solid defender. Justin Bibbs (11.7 ppg., 45.0% 3pt.) had a breakthrough sophomore year at shooting guard, emerging as one of the better 3 point shooters in the conference. While there isn't a huge incoming recruiting class, the Hokies do have one major addition in redshirt sophomore Ahmed Hill, who is returning from a partially torn knee ligament. Hill's a very similar player to Bibbs and put up similar numbers as a freshman (8.7 ppg., 3.7 rpg., 38.6% 3pt.). Now that Williams has so many larger, more efficient options at his disposal, senior Seth Allen (14.7 ppg.) could see his role decreased to that of a heat check gunner off the bench as a senior. His shooting was inconsistent (39.4% fg., 28.0% 3pt.) and he had a negative assist to turnover ratio last season, but he received big minutes with Hill unavailable. There was little reason to believe the Hokies would be able to compete inside prior to last season, but Zach LeDay, a transfer from South Florida that had produced next to nothing in his first two years of college eligibility, seemingly came out of nowhere to give Virginia Tech a hard nosed, imposing, skilled post presence. He was reason number one for the Hokies dramatic improvement in Williams second year, leading the team with 15.5 points, 7.9 rebounds, and 1.7 blocks per game and shooting 35.6% from behind the arc for good measure. The unexpected losses of Kerry Blackshear and Johnny Hamilton leaves Virginia Tech somewhat undersized, but Chris Clarke was the likely starter as an undersized power forward even before those injuries. 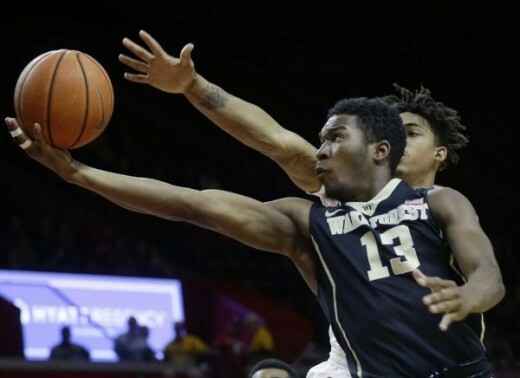 Clarke quickly emerged as an important player as a freshman, and his return from a 13 game midseason injury absence was the second key to the second half turnaround. Clarke's exactly the type of high motor player that Williams covets; he led the team in steals per game and finished second in rebounds per game, and he's a high percentage scorer inside the arc that is slowly adding range. Williams has grown accustomed to being limited to small lineups over the past two years, so this will not be anything new. 6-9, 245 pound freshman Khadim Sy could provide rebounding and shot blocking as the third member of the interior rotation. The Hokies were statistically unimpressive across the board last year, but a healthy Chris Clarke and Ahmed Hill and a rim-protecting Khadim Sy should improve the defensive and rebounding numbers, Justin Robinson's maturation and a potential decrease in playing time for Seth Allen should improve the assist to turnover ratio, and Hill's return and fewer shots for Allen should improve shooting percentages. Virginia Tech was fortunate enough to lure a young, successful coach to town two years ago despite their botched handling of Seth Greenberg's firing, and it seems very likely they will find themselves back in the NCAA Tournament for the first time in ten years. Dec. 29 pre-conference update: While the Hokies are about where they were a year ago defensively, they have improved significantly in almost every offensive category. They take care of the basketball on par with Buzz Williams' best Marquette teams (23rd in assist to turnover ratio), and this may be the best shooting team that he has ever had (43rd in 3pt.%). A surprising part of that jump in efficiency has been the improved play of Seth Allen, who is shooting 54.8% overall and 44.4% behind the arc. In the post, Khadim Sy (6.1 ppg. on 65.3% shooting, 3.9 rpg., 1 bpg. in 13.4 minutes) isn't quite as far along offensively as the missing Kerry Blackshear, but he's a step up as a rebounder and shotblocker and he's actually more efficient on the offensive end because he doesn't attempt to step outside of his comfort zone. The Hokies are a scrappy group that can score, and they should prove to be a tough matchup for everyone. Feb. 13 update: The loss of Chris Clarke to a knee injury is a gigantic blow to Virginia Tech; he's their best defender and rebounder, and he's a great passer as well. The Hokies have been stealing minutes with Ty Outlaw at power forward all year, but they lose a great deal in each of those areas with him on the floor. Outlaw is a dangerous outside threat (37.5% 3pt.) and does help stretch the floor, but the Hokies just became significantly less competitive defensively and on the boards. Buzz Williams may still be able to get his team back to the NCAA Tournament for the first time since 2007, but a run there now seems unlikely until next season. March 6 Postseason Update: Ty Outlaw has put up video game numbers since Chris Clarke's injury, averaging 15.6 ppg. And shooting 71.9% from 3 on 32 attempts over his last five games. The Hokies will attempt to do their best Notre Dame impression in the postseason by trying to win with one big on the floor and maintaining a high efficiency, three point launching offense. It could work; Virginia Tech is 11th in the country in 3pt. percentage, 10th in overall field goal percentage, and a very respectable (although not quite to the level of the Irish) 59th in assist to turnover ratio. They also have the same problems, currently ranking 264th in rebounding margin, 217th in field goal percentage defense and 251st in 3pt.% defense – all worse marks than Notre Dame. The Hokies may be able to outscore some people early on in the NCAA Tournament, but Chris Clarke was still a big loss and they may not be at Notre Dame's level just yet. Davon Reed will see the ball much more as a senior. Departures: Sheldon McClellan (16.3 ppg., 40.6% 3pt. ), Angel Rodriguez (12.6 ppg., 4.5 apg., 1.7 spg. ), Tonye Jekiri (7.6 ppg., 8.6 rpg.) and Ivan Cruz Uceda (5.4 ppg., 44.8% 3pt.%) graduated; James Palmer transferred to Nebraska. Expectations won't be nearly as high for the Hurricanes after losing arguably their three best players to graduation following last year’s Sweet 16 appearance, but they do welcome the best recruiting class Jim Larranaga has ever had, and he will again have ample talent to work with. Miami didn’t exactly excel at taking care of the basketball last season (they finished 118th in assist to turnover ratio), and that was before the graduation of a reasonably efficient senior backcourt. The offense is left in the hands of junior JaQuan Newton (10.5 ppg., 34.6% 3pt. ), a shoot first point guard that finished last season with just north of a 1 to 1 assist to turnover ratio. He’s quick and shoots reasonably well, so he should have a nice year scoring, but the offense needs a facilitator. There aren’t many alternatives, either; it has even been a consideration to try 6-8 sophomore Anthony Lawrence, who played point guard in high school but spent last season as a stretch 4 off the bench, at the position. He did have a 2 to 1 assist to turnover ratio as a freshman, but he obviously didn’t have the ball in his hands very often. The team is in better shape at shooting guard, although it would be a stretch to expect a freshman to provide as much as McClellan did as a senior. The likely starter will be 6-3 freshman Bruce Brown; a top 30 recruit, he’s a high end shooter and hard nosed defensive player, but he doesn't yet have the skills to contribute at point guard. The Canes also bring in highly regarded 6-2 Australian guard Dejan Vasiljevic, but like Brown he is strictly a scorer offensively. He’s also considered a strong defensive player, so he should also see minutes right away – but again, not at point guard. Senior Davon Reed (11.1 ppg., 4.1 rpg., 38.3% 3pt.) is the best known commodity on the perimeter, and he will have a chance to make a name for himself nationally without Sheldon McClellan to overshadow him. Reed is strong, agile, and explosive with long arms and a solid jump shot; he’s definitely capable of more. Even without McClellan and Uceda, the Hurricanes should again shoot the 3 well (they were 44th in 3pt.% a year ago), and the spacing that provides will make things easier for whoever ends up running the offense. Dewan Huell, a 6-9 top 25 prospect, is the most highly regarded high school player Larranaga has ever signed, and he will be given the task of replacing Jekiri. He won’t have Jekiri’s strength as a freshman, but he’s a quicker, better coordinated athlete that should be ready to score from midrange immediately. He’ll be joined by 6-8 senior Kamari Murphy (5.6 ppg., 6.0 rpg. ), an aggressive and energetic athlete that became increasingly assertive as the season wore on. Larranaga will also have two traditional centers available in Rodney Miller, a 6-11, 245 pound top 100 prospect, and 6-10 sophomore Ebuka Izundu, who added significant weight over the summer and has the potential to develop over time in the same way that Jekiri was able to. Lawrence (42.9% 3pt.) was particularly effective with the stretch part of a being a stretch four; he’s the team’s leading returning 3 point shooter, and will get more opportunities somewhere. How Newton develops as a junior will be a major factor in how good this Miami team can be, but if Larranaga were to decide to give Lawrence a chance at point guard things would get really interesting. There is still plenty of talent and a great coach, so the Hurricanes should still be good, but the compulsory youth movement makes a middle of the conference finish a more likely scenario for the upcoming season. Dec. 29 pre-conference update: The Hurricanes defense has been every bit as imposing as Louisville (6th in fg% defense, 7th in 3pt% defense, 22nd in rebounding margin)- albeit against a noticeably weak non-conference schedule. Unfortunately, even against a questionable schedule, the offense has been awful, and, unlike Louisville, they don't pass well and have not been able to take care of the basketball (251st in assist to turnover ratio). Miami's assist to turnover ratio is below 1 to 1, and, as it turns out, if a team can't pass, it can't shoot either (148th in 3pt%), because no one is getting open looks. Ja'Quan Newton has not been a good distributor, and there really isn't another option as Anthony Lawrence has struggled as well. It appears help may be on the way for next season in the form of Chris Lykes, but the going is likely to get rougher for Miami in ACC play. Feb. 3 update: JaQuan Newton's days as a point guard are almost certainly numbered, but with Shannon Brown emerging as a solid secondary ballhandler and Davon Reed returning to form and having the senior year that was expected the Hurricanes should now be able to score enough points to get back to the NCAA Tournament behind an at times suffocating defense (currently 34th in FG% defense, 57th in 3pt.% defense, and 29th in rebounding margin). March 6 Postseason Update: A late season suspension of Ja'Quan Newton was a blessing in disguise for the Hurricanes, who won three games in a row in his absence including a road win at Virginia. While Bruce Brown isn't really a point guard, he's a more efficient stand-in than Newton, who has a negative assist to turnover ratio on the season. The Hurricanes' strength is defense, but any improvement at the offensive end goes a long way towards improving their outlook for March. 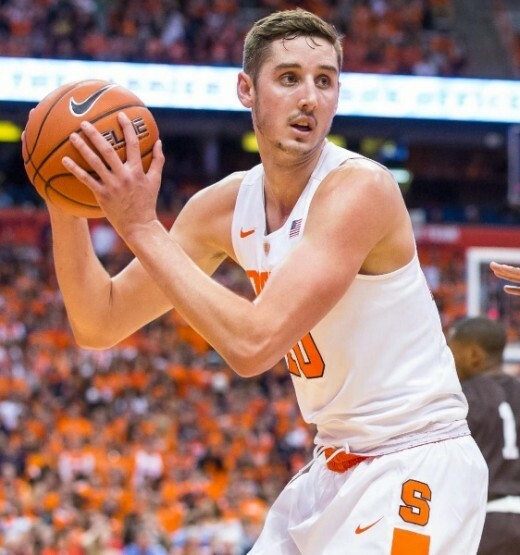 It would be nearly impossible for Tyler Lydon to shoot better as a sophomore, but he should be more of a presence in the post with a stronger frame. Departures: Michael Gbinije (17.5 ppg., 4.1 rpg., 4.3 apg., 1.9 spg., 39.1% 3pt.) and Trevor Cooney (12.9 ppg., 35.4% 3pt.) graduated; Malachi Richardson (13.4 ppg., 4.3 rpg., 35.3% 3pt.) was a first round draft pick; and Kaleb Joseph transferred to Creighton. Michael Gbinije's development into a second team All-ACC point guard saved Boeheim's offense two year's ago when plan A fell through, and he was a major reason for the team's Final Four run last season. He was very much a work in progress when he transferred to the school, and the same can be said of his heir apparent, Franklin Howard. A top 100 prospect a year ago, Howard shot horribly as a freshman (28.6% overall, 10.5% 3pt. ), although he definitely has the potential to create for himself in time. Perhaps more important for the Orange's immediate needs, Howard did manage a 2 to 1 assist to turnover ratio, and at 6-5 he continues the Syracuse tradition of having long, athletic guards to defend the perimeter in Boeheim's zone. Boeheim played Howard reluctantly last season, although he clearly preferred him to the since departed Kaleb Joseph. In case Howard isn't ready to take over or plays out of control on occasion, Boeheim added Colorado St. graduate transfer John Gillon (13.2 ppg., 3.8 apg. At CSU) to provide a veteran alternative and to fill out a thin perimeter rotation. At 6-0, Gillon isn't an ideal fit for Boeheim's zone, but he provided a better than 2 to 1 assist to turnover ratio in his time at Colorado St., he's a career 36.4% 3pt. shooter, and his speed off the dribble will provide a nice wrinkle for the offense. 6-6, 220 pound freshman Tyus Battle, a top 25 recruit, is a similar athlete to Richardson that should also be able to contribute from behind the arc. If the Orange are going to be successful, Battle has to become effective eventually. That need won't be immediate because of Boeheim's biggest offseason addition, who came to the program extremely late. Andrew White, a 6-7 graduate transfer from Nebraska, didn't make his intentions known until late August, but he makes a huge impact on the potential success of the Orange. After posting 16.6 points and 5.9 rebounds per game while shooting 41.2% from behind the arc in the Big Ten, White provides a proven power conference scorer and high end shooter that Syracuse was dearly missing. His presence also means that Boeheim won't have to spend extended periods of time with three true big men and just two perimeter players on the floor, which was a very real possibility prior to his arrival. Shooting was a major issue for the Orange a year ago (248th in overall field goal percentage), but White could go a long way towards repairing the problem. The Orange didn't lose any frontcourt contributors, and with reinforcements should become one of the better ACC teams in the paint. Tyler Lydon (10.1 ppg., 6.3 rpg., 1.8 bpg.) will move into the starting lineup after playing remarkably well at both ends of the floor as a freshman; he shot incredibly well (47.9% overall, 40.5% from 3), and his timing and long arms allowed him to be an imposing shot blocker that was even able to block shots on the perimeter. Lydon's a projected first round pick in next year's draft; with added strength, he'll become an imposing presence inside the paint as well as out, and with increased opportunities he may even lead the team in scoring. Senior Tyler Roberson (8.8 ppg., 8.5 rpg.) doesn't have the same scoring potential, but he's an offensive weapon in his own right as one of the conference's best offensive rebounders. The big new addition to the frontcourt is 7-2 Providence transfer Paschal Chukwu, a top 70 recruit two years ago that will likely prosper more in Syracuse's zone than he did with the Friars. Chukwu posted solid rebounding and shot blocking rates in limited minutes as a freshman. DaJuan Coleman is still around as well after receiving an additional redshirt year; while he's never going to live up to his original top 15 ranking, he's an active and agile (but not explosive) big body that is a capable scorer in the post. Syracuse also welcomes a top 80 recruit in 6-9 Taurean Thompson. Thompson is a work in progress offensively and will be a little light as a freshman, but he's athletic and aggressive enough that he could help defensively and on the boards when needed. The Orange were 222th in rebounding margin and 59th in blocked shots last year; rebounding should improve as the Orange get bigger along the front line, and the addition of Chukwu to Lydon could make Syracuse one of the better shot blocking teams in the country. Syracuse will once again feature an imposing defense; steals will decrease (Gbinije and Cooney were great defenders), as will 3pt.% defense (17th last season - Gillon will be a liability there), but overall field goal percentage defense (59th), rebounding, and shot blocking should improve. Offensive efficiency was set to take a tumble, but the addition of White helps fix that, and the frontcourt of White, Lydon, and Roberson could be one of the best offensive groups in the country. Jim Boeheim seemingly made the impossible happen by taking his team to the Final Four in the face of NCAA punishment last season; while that shouldn't be the expectation this year with the uncertainty in the backcourt, it will be a possibility. Dec. 29 pre-conference update: Capped by an atrocious blowout home loss to what is really not a very good St. Johns team, the Orange struggled horribly in their non-conference schedule, and they will enter ACC play with a lot to figure out. Frank Howard (7.1 ppg., 6.2 apg., 2.1 spg., 35.5% 3pt.) has been maddeningly inconsistent shooting the basketball - but he does make good things happen, and he flashes loads of potential. Tyler Roberson, who was tremendously important to the team's success over the past two years, saw an inexplicable drop in minutes (down to 13.3 minutes per game) over a seven game span, four of which they lost, and offensive rebounding fell off accordingly (currently 92nd nationally against a weak non-conference schedule after finishing 80th a year ago). Finally, Paschal Chukwu was unable to secure a spot in the rotation (he still leads the team in blocks anyway), and Syracuse will not defend the rim nearly as effectively as a result. The Orange somehow rank in the top 50 in almost every major offensive and defensive statistical category other than rebounding and free-throw shooting, so there is still plenty of reason for optimism – the team just hasn't been winning games. There will be ample opportunity for big wins in the ACC, and Jim Boeheim again has plenty of talent on the roster, so an NCAA Tournament run is still entirely within the realm of possibility for Syracuse. Feb. 3 update: Syracuse has come a long way and has finally found a rotation that works, but the poorest non-conference showing among ACC teams means that the Orange likely needs to win as many as 11 ACC games to receive an NCAA bid. The Orange also haven't been able to take the show on the road, and they will need to prove themselves there as well. Upcoming visits to Clemson, Pittsburgh and Georgia Tech are all games the Orange need to win. March 6 Postseason Update: John Gillon (16.7 ppg., 6.6 apg., 50% 3pt. over his last 10 games) and Tyus Battle (20 ppg., 44.4% 3pt. over the last 3 games) have improved dramatically as the season has gone on, while Tyler Lydon is a high end NBA prospect and Andrew White III really wants to be. The Orange still have the potential to make a run in March, but realistically they will be one of the worst road teams to reach the NCAA Tournament. Syracuse is 2-10 away from home, and they have a very real tendency to get blown out there with six of those losses being by double digits. A strong showing in the ACC Tournament would be a step in the right direction, although those might as well be home games as well with the tournament being held in New York. A deep NCAA run this year might actually be a bigger surprise than it was a year ago. Bryant Crawford is about to break out his best Demetrius Jackson impression. Departures: Devin Thomas (15.6 ppg., 10.2 rpg., 1.6 bpg.) and Codi Miller-McIntyre (9.4 ppg., 4.5 rpg., 4.0 apg.) graduated; Rondale Watson transferred to Marshall. Last season was a brutal disappointment for Danny Manning and the Deacons. With well regarded senior leadership and a strong recruiting class, there was every reason to believe the team would begin to climb the ladder to respectability in the ACC. They did manage to get off to a strong start, going 6-2 in their first 8 games including wins over Indiana as well as three other power conference schools, but then the walls came tumbling down as the team struggled to a 5-18 mark over their final 23 games, managing only two conference wins. That falloff corresponded with the return of the now graduated Cody Miller-McIntyre, who struggled as a senior and, more importantly, seemed to disrupt the chemistry that was evident in the team's early success. The lone point guard during those first 8 games was Bryant Crawford (13.8 ppg., 4.4 apg., 1.7 spg., 34.8% 3pt. ), who will once again be entrusted with the offense as a sophomore. While he struggled with inconsistency shooting the ball and with turnovers as a freshman, he's a capable three point shooter and passer and a disruptive defensive presence, and when he sees an opening he's as explosive attacking the basket as anyone in the ACC. He'll still have some off nights, but he should put up big numbers overall and be the key to any big wins the Deacons can manage. Depth at point guard will likely come from a familiar name in freshman Brandon Childress, a 4-star recruit and the son of 90's star Randolph Childress. Brandon is more of a pure point guard than his father was, but he should be able to hit an open 3 as well. He will need to add strength, but should be able to help run the offense as a freshman. Among the players most effected by Miller-McIntyre's return was junior shooting guard Mitchell Wilbekin; he averaged 10.8 points per game on 40.9% 3pt. shooting in those first eight games, but managed just 6.1 points on 31.1% shooting thereafter as his opportunities decreased with two ball dominating point guards on the floor. Wilbekin may be relegated to a bench role as a junior due to the addition of 6-3 transfer Keyshawn Woods. Woods hit an eye opening 46.6% of his shots from behind the arc as a freshman at Charlotte two years ago; he may be able to do more to open the floor for Crawford than Wilbekin, although Wilbekin's 2 to 1 assist to turnover ratio was helpful. Danny Manning was forced to cut talented wing Cornelius Hudson when Hudson was unable to stay out of trouble off the court last season, but he was able to help ease the loss with the addition of 6-6 graduate transfer Austin Aryans from UW-Milwaulkee. Aryans is limited athletically and won't be particularly helpful defensively or rebounding the basketball, but he averaged 11.4 points on 35.3% shooting from 3pt. range, which should help open the lane for Crawford, and his better than 2 to 1 assist to turnover ratio as a junior will be more helpful to the team's offensive efficiency than Hudson would have been. Junior Greg McClinton will be the defensive alternative to Aryans at small forward; while there is certainly a possibility that he can contribute more at the offensive end, he has been tentative in that area to this point. When the Deacons need a forth big man, McClinton will likely be asked to slide to power forward as he did a season ago. While Devin Thomas will certainly be missed after a great career as a dominating post presence, the frontcourt will still be a strength for the Deacons because of the talent of their rising sophomores. 6-10 John Collins struggled with inconsistent minutes and touches as Manning desperately tinkered with the rotation late in the season, but he averaged an impressive 9.5 points, 5.4 rebounds, and 1 block in just 15.1 minutes per game during the teams 8-3 start. With added strength and more consistent minutes, Collins should emerge as an imposing post presence as a sophomore. Collins will be well complimented by 6-10 junior stretch 4 Konstantinos Mitoglou (9.2 ppg., 5.4 rpg.). While he struggled with his shot once the wheels fell off late in the season, Mitoglou did shoot 38.2% on 5.1 attempts per game from behind the arc during the team's first 16 games. 7-1 Doral Moore is further reason Manning should be optimistic about his frontcourt; a top 70 recruit a year ago, he wasn't quite as far along as Collins, but he likely could have been productive with more minutes as well. In the only two games where he received 20 minutes of playing time, he averaged 16 points, 7.5 rebounds, and 3 blocks. Moore finished tied for 2nd on the team in blocked shots despite averaging just 7.1 minutes a game, and his final rebounding rate was impressive as well. With improved conditioning, he should have a breakthrough sophomore year. The Demon Deacons struggled with offensive efficiency last season, finishing 233rd in the country in assist to turnover ratio and 301st in 3pt. shooting. The maturation of Crawford as a sophomore and the addition of an offensively efficient small forward (Hudson had a negative assist to turnover ratio) should cut down on turnovers, while Woods and Aryans represent significant upgrades to Miller-McIntyre and Hudson shooting the 3. Even with Thomas's departure, Collins, Mitoglou, and Moore could emerge as one of the more imposing frontcourts in the conference, and there are likely to be plenty of blocked shots to help at the defensive end (Wake was 206th in the country in FG% defense a year ago). In Wake Forest's biggest win of the year against Indiana, Manning played a total of 8 players, and one of those for just four minutes. As the season wore on, more and more players were used, and the team became less and less successful. If he can decide on who his best players are and design his rotation accordingly by the time conference play begins, the Deacons will have a much better chance to succeed. With the amount of talent now on the roster, this season should serve as a litmus test for just how good of a coach Danny Manning can be. At the very least, Wake Forest should win significantly more than 2 ACC games this season and be in line for a postseason berth; depending on how much the sophomores improve, Manning might even lead the Deacons to one of what should be as many as 9 NCAA berths for the ACC in just his third year at the school. Dec. 24 pre-conference update: Danny Manning's offseason additions and improving sophomores have the Deacons looking much improved, particularly at the offensive end. Led by Keyshawn Woods (12.9 ppg. on 51.3% 3pt. ), the team is suddenly very dangerous behind the arc (50th in 3pt.%), John Collins is already a better post scorer than Devin Thomas (17.3 ppg. on 59.7% shooting, 10.4 rpg., 1.7 bpg. ), and Bryant Crawford (14.3 ppg., 6.3 apg., 1.7 spg.) has picked up where he left off at the beginning of last season as an excellent floor leader. The Deacons fumbled their three most difficult non-conference matchups, but those games were all away from home and a late December win versus LSU and a strong showing versus Xavier should serve as confidence builders. March 6 Postseason Update: The Deacons put themselves back on the bubble by ending their season with wins against Louiville and on the road against Virginia Tech. They still can't afford a loss to Boston College in the first round of the ACC Tournament, and may need a win beyond that to firmly cement their position. Wake Forest will be an unwelcome matchup in whatever tournament they end up in; they've played one of the toughest schedules in the country and closed out the season strong, and they feature a now dominant John Collins (23.4 points and 10.9 rebounds over his last 13 games) surrounded by very capable shooters (43rd in 3pt. %). Tadric Jackson can score from much further away now. Departures: Marcus Georges-Hunt (16.7 ppg. ), Adam Smith (15.0 ppg., 41.4% 3pt. ), Charles Mitchell (10.1 ppg., 9.7 rpg. ), Nick Jacobs (10.5 ppg., 5.8 rpg. ), and James White (4.4 rpg.) graduated. Georgia Tech made a very necessary coaching change after last year’s NIT appearance; in spite of the temporary success, recruiting was going nowhere, and players simply were not developing over time. Unfortunately, the hire that Georgia Tech settled on is questionable at best, and the team graduated five of its top six players (four of whom were transfers- someone else had taught them how to play). Senior Josh Heath will again be given the reigns to the offense after Gregory turned it over to wing Marcus Georges Hunt last season. He's limited athletically and can’t shoot, but he did have an assist to turnover ratios over 3 to 1 last season, so there’s that. The other option will be 3 star prospect Justin Moore, who at 6-5 was a noticeably thin 160 pounds when he enrolled. 6-2, 215 pound junior Tadric Jackson will take over at shooting guard. Jackson was a top 90 prospect coming out of high school due to his impressive athletic ability, but his shooting has been atrocious. His 38.5% from the field and 27.7% from behind the arc as a sophomore actually represent significant improvements over his freshman marks. Jackson could have a very interesting season because he’s the only guard on the team athletic enough to be able to get off his own shot. If his shooting percentages don’t improve, his season could turn into a brickish nightmare. 6-9, 187 pound senior Quenton Stephens, one of streakiest shooters in college basketball, will start at small forward. If the Yellow Jackets are going to win any conference games, it will probably be on nights when he’s hot. Two more 3 star prospects - 6-4 guard Josh Okogie and 6-6 small forward Christian Matthews - will have a very real opportunity to contribute as freshman due to the limitations of Georgia Tech's roster. If there is one player that is going to have a strong year for the Yellow Jackets, it will be Ben Lammers. The 6-10, 241 pound junior received limited opportunities due to all of the senior talent, but he managed 4 rebounds and a team leading 1.3 blocks in only 14.8 minutes per game as a sophomore; he could legitimately average 8 rebounds and 2.5 blocks per game as the starter. Otherwise, the leading options in the paint will be two projects, 6-9 redshirt sophomore Abdoulaye Gueye or 6-10 redshirt freshman Sylvester Ogbonda, so Lammers should receive all the minutes and touches he can handle. Josh Pastnor was an excellent recruiter early in his tenure at Memphis following in the wake of John Calipari’s departure. That had fallen off somewhat over the past couple of years; he left a roster that included three top 100 prospects and another one coming in that decommitted when he took the job with Georgia Tech, but two of those recruits, the Lawson brothers, only took his offer after Pastnor gave their father a job as an assistant coach. In addition, that talent did not translate into wins once the Tigers moved to the newly formed, more competitive American Athletic Conference, as the team did not make the NCAA Tournament or NIT either of the last two years. It seems highly unlikely that another step up in competition with regards to both talent and coaching would be beneficial. In addition, one of the main recruiting draws at Memphis was an almost guaranteed NCAA Tournament appearance out of a clearly inferior Conference USA; once it becomes clear that those appearances will become few and far between at Georgia Tech, it’s a very real possibility that recruiting will evaporate completely unless someone else is looking to use their children as a bribe. Beyond the fact that Pastnor’s recruiting acumen may now be little more than a mirage, coaching searches for programs struggling to win in the ACC should probably be focused more on player development and actual on court success with slightly less talent than on recruiting success, as the former heavily influences the latter anyway. As an example, Tubby Smith is a horrible recruiter (partly because of his style of play), but he’s one of the best on-the-court coaches in the country (he won a national title the only time he was ever given elite talent), and he was able to take a talent-challenged Texas Tech team to a shocking NCAA Tournament appearance in his third year at the school. The emphasis needs to be on teaching, and that is a lesson that Georgia Tech will likely have a chance to learn over the next couple of years. As for this season, Georgia Tech could be historically bad shooting the basketball, and they’re likely to have problems defending the perimeter. Josh Pastnor said that everyone would be picking Georgia Tech to finish last in the ACC; considering the situation at BC, he is shockingly incorrect. Dec. 29 pre-conference update: Georgia Tech at the very least did not hurt the ACC as much in non-conference play as they could have, as they avoided any bad losses and even had a nice road win against VCU. Point guard play and scoring are going to be issues, but the team defends fairly well. Ben Lammers (14.9 ppg., 10 rpg., 2nd in the country with 3.9 bpg.) has indeed been outstanding, and he should land on an all-conference team at the end of the year. While Quentin Stephens (10.1 ppg., 8.1 rpg., 1.3 spg., 1.2 bpg.) is going to be pushed around a bit in ACC play, he has proven to be a scrappy defensive playmaker that can affect the game with his length and mobility since being moved to power forward a few games ago. On the perimeter, Josh Okogie (13.3 ppg.) has been a pleasant surprise after adding over 20 pounds of muscle since his senior year of high school. Finally, the most positive development for the Yellow Jackets has been the remarkable improvement of Tadric Jackson. After shooting horribly for two seasons, he has come out on fire (12.1 ppg. on 51.6% 3pt.). While it will still be a difficult year for the Yellow Jackets in a loaded ACC, the situation isn't quite as dire as it first appeared to be. Feb. 3 update: For anyone that doubted the hiring of Josh Pastnor (like me- I did that), he has more than met the challenge. While Pastnor has the team competing at both ends every night, the most important part of the Yellow Jackets' surprising success has been the drastic improvement of players that simply did not occur under Brian Gregory. Tadric Jackson and Quentin Stephens are completely different players, and Josh Okogie was not expected to contribute like this as a three star prospect (adding 20 pounds of muscle since his senior year of high school has certainly helped); Pastnor has to be given credit for much of that development. The Yellow Jackets only have two big men that belong on the floor in the ACC, but both Ben Lammers and Quentin Stephens are in such good shape and are so adept at staying out of trouble that the Yellow Jackets have the best frontcourt on the floor for the majority of most games, and that should allow the team to continue its success in ACC play. 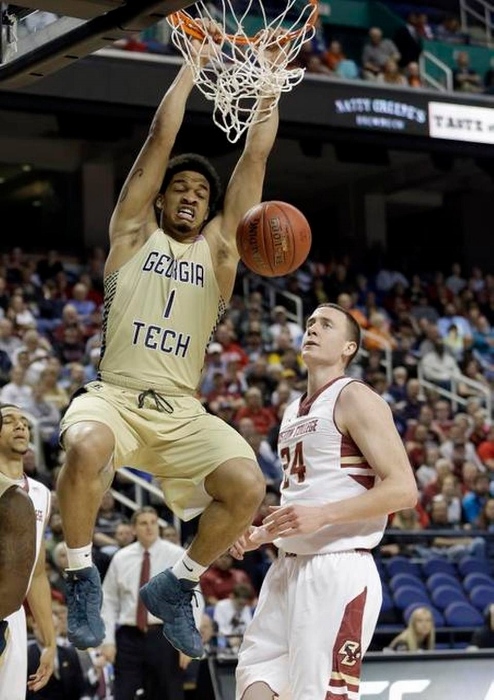 There is a possibility that the Yellow Jackets could sneak in to the NCAA Tournament in Pastnor's first year, but more importantly the future may in fact be bright at Georgia Tech. 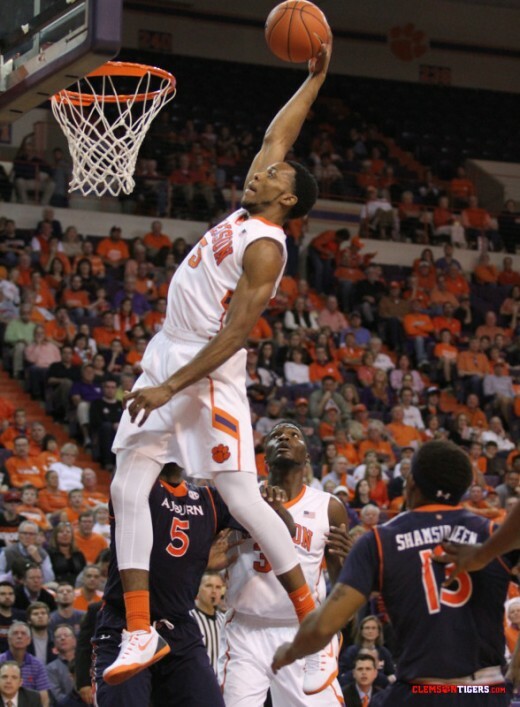 Jaron Blossomgame's remarkable shooting percentages were not the result of dunks- although he can do that too. Departures: Jordan Roper (8.8 ppg., 3.8 apg.) and Landry Nnoko (8.1 ppg., 5.7 rpg., 2.3 bpg.) graduated. Clemson was a surprising omission from last year's NIT Tournament; the extra games would have been beneficial, but the season was still reason for optimism. Brad Brownell produced the best offensive team of his tenure, and the Tigers had a truly great month of January that included wins against 5 NCAA Tournament teams. The most positive development for last year's Tigers was a dramatic increase in offensive efficiency; unfortunately, the key figure in that development was Jordan Roper, who produced a nearly 3 to 1 assist to turnover ratio in his only real season at point guard (the team finished 48th in that category). Still, there is hope that the team can pick up where it left off. Senior Avry Holmes (10.0 ppg.) started beside Roper, and he produced a 2 to 1 assist to turnover ratio with limited opportunities running the point. He's a capable drive and dish point guard, and there's reason to believe he can shoot better than the 33.3% he shot from behind the arc a season ago, as he was a 43.9% 3pt. shooter in two years at San Francisco before transferring. Sophomore Ty Hudson, a top 100 recruit a year ago, was clearly a work in progress as a freshman, but he also posted a better than 2 to 1 assist to turnover ratio in limited minutes. He's fast and aggressive when he sees the opportunity, and if he has picked up enough of what Brownell needs him to do, point guard would again be a strength. 6-4 transfer Shelton Mitchell will get a look as well; he was a top 50 recruit at one time as a big, true point guard, but he produced remarkably little in extended minutes as a freshman at Vanderbilt (4.3 ppg., 3.3 apg. in 20 mpg.). It would be a stretch to expect much from him at this point, but the potential is still there. 6-4 transfer Marcquise Reed provides reason to believe Brownell's offense could actually improve once more; he averaged 15.1 points per game on 49% shooting from the field and 41.3% from behind the arc as a freshman at Robert Morris, and he should start beside Holmes. If Reed can even come close to replicating those percentages for the Tigers, it would represent a major upgrade, and the increased floor spacing would help Holmes get his shot off as well. Junior Gabe Devoe was a constant in Brownell's seven man rotation last year; although he was inconsistent with his jump shot, Brownell could depend on him to do what he needed. At small forward, 6-8 junior Donte Grantham (10.2 ppg., 4.1 rpg., 35.4% 3pt.) became more confident and aggressive and emerged as a more consistent offensive threat as a sophomore, and the potential is there for him to continue to develop in much the same way that Jaron Blossomgame has. Blossomgame was a first team All ACC selection after averaging 18.7 points on a remarkable 51.3% from the floor and 44.6% from behind the arc to go along with 6.7 rebounds per game. There isn't much more he can do beyond improving his rebounding rate. 6-10 senior Sidy Djitte (5.3 ppg., 5.2 rpg.) will start at center during the first semester; he doesn't block shots or score in the post like Nnoko was able to do as a senior, but he is a strong rebounder and on the ball post defender. 6-9 Texas A&M transfer Elijah Thomas, a top 30 recruit last year, will likely take over at center when he becomes eligible during the second semester. There were limited opportunities for him in the Aggies' loaded frontcourt, but he posted high rebounding and shot blocking rates while he was there, and he should actually be a step up from Nnoko offensively. With Thomas ineligible for the first semester, Donte Grantham will likely need to play significant minutes at power forward in the non-conference season unless 7-0 junior Legend Robertin has progressed enough to recieve regular minutes. While Roper proved valuable as a primary ball handler as a senior, he never really lived up to the promise he had shown shooting the basketball as a freshman. Clemson was 193rd in overall field goal percentage and 147th in 3pt.% last season, and those numbers have been par for the course during Brownell's tenure; however, that could change with the addition of Reed, a return to form for Holmes, and the addition of a more dangerous scoring and passing threat in the post in Thomas. If the Tigers can put four dangerous shooters on the floor consistently, which it appears they now have the personnel to do, everything will be easier on the offensive end, and some of the pressure will be taken off Blossomgame. With Blossomgame once again forced to play out of position at power forward, rebounding will continue to be an issue at times (the Tigers were 178th in rebounding margin last year); still, Brownell will have his team ready to defend as always, and the offense could once again be his best. If the team shoots as well as it should, Clemson will have a chance to return to the NCAA Tournament for the first time since Brownell's first season in 2011. Dec. 29 pre-conference update: Clemson came away with a strong non-conference record, but there are reasons for concern. Point guard could be an issue, Shelton Mitchell looked strong against a few cupcakes after taking over, but he put up 1 assist, 7 turnovers and 4 personal fouls in 24 minutes against South Carolina. Jaron Blossomgame has been mired in a horrible shooting slump (he's 6 for 36, 16.7%, on the year) after shooting so well throughout last season and the pre-draft process, and beyond transfer Marcquise Reed the team doesn't shoot well from deep (206th in 3pt. fg.%). The Tigers are in excellent position heading into conference play and can likely finish below .500 in the ACC and still gain an NCAA berth, but Blossomgame will have to find his stroke and the team will have to find a point guard in ACC play. Feb. 3 update: While point guard play has definitely been a roller coaster ride for Clemson, the real reason for their failure has actually been at the defensive end. The Tigers rank 177th in FG% defense, 138th in 3pt.% defense, and an atrocious 263rd in rebounding margin. With Jarron Blossomgame set to graduate, the Brad Brownell era could be drawing to a close soon in Clemson. Damon Wilson will improve, but he probably won't be the new Wade Baldwin as a sophomore. Departures: James Robinson (10.2 ppg., 5.0 apg. ), Sterling Smith (40% 3pt. ), and Rafael Maia (3.6 rpg) graduated. There was a lot of grumbling about the hiring of Kevin Stallings, but those opinions may have been too heavily dependent on the performance of his final Vanderbilt team (and an overblown sense of what Pittsburgh should be able to accomplish in the current ACC). Those Commodores were blown out in the First Four and only managed a 19-14 record despite featuring two NBA first round draft picks and playing in an SEC that sent just 3 teams to the NCAA Tournament. However, over his last 13 years at the school, Stallings made 7 NCAA appearances, including 2 Sweet 16s and 6 total wins, and made the NIT 3 of the other 6 years. Those would be thoroughly respectable results for a non-blue blood ACC team (look at Boston College now vs. their time with Al Skinner). Both Pittsburgh (26th in assist to turnover ratio) and Vanderbilt (59th) took care of the basketball last year- but Stallings had a possible lottery pick at point guard, while Pittsburgh featured remarkably efficient senior James Robinson. The options this season will be limited to a sophomore and a freshman. The sophomore, 6-5 Damon Wilson, was a top 80 recruit last season that understandably saw limited minutes behind Robinson. His shot is a work in progress, but he did manage a 2 to 1 assist to turnover ratio, and his length presents interesting possibilities defensively. The freshman is 6-1 Justice Kithcart, a quick and aggressive 4 star prospect whose jump shot is also in need of work. Stallings inherits a more immediately promising situation on the wings. 6-6 senior Chris Jones, one of the options at shooting guard, is a solid athlete and could probably score more, but he hasn’t been aggressive looking for his shot and struggled to hit from outside last season after leading the team in made 3’s as a sophomore. His competition will be 6-7 sophomore Cameron Johnson; while not as fast as Jones, he has flashed potential as well, and he did manage to hit 37.5 % of his 3’s last year. James Artis (14.4 ppg., 4.8 rpg., 36.3% 3pt.) will again be one of the team’s go to offensive weapons at small forward; he’s skilled and tough, and will want another shot at the NCAA Tournament as a senior. Defending the 3 was a strength for Stallings' Vanderbilt team (they were 4th in in 3pt.% defense), and with so much length and athleticism on the perimeter (particularly when Wilson is at point guard), that should be true at Pittsburgh as well, which would be a huge advantage in the current ACC. Michael Young (15.7 ppg., 6.9 rpg. ), Artis's long time tag team partner, should lead the team in scoring and rebounding once more as a senior. Scoring could actually get easier for him playing next to a stretch five, which are really the only options Stallings will have at his disposal. 6-8, 225 pound senior Sheldon Jeter (8.1 ppg., 4.8 rpg) is the likely starter at center; he’s extremely active and mobile, and he will block a shot or two. The only real depth will be provided by 6-9, 215 pound junior Ryan Luthor (44.4% 3pt.). He’s competitive in the paint and a very capable outside shooter that should excel with increased opportunities. While they’re all active and tough, none of those three are really bulky enough to defend large post scorers. Vanderbilt was 5th in the country in field goal % defense last season, but they benefited heavily from 2 shot blocking seven footers, and Pittsburgh (157th) doesn’t have that to offer. On the other hand, rebounding was a strength for the Panthers last season (24th in rebounding margin); while that hasn’t been traditionally been the case for Stallings’ teams (Vanderbilt was 148th last year), he does adopt a roster that’s fairly good at it. Kevin Stallings recruits well and his players do develop over time (Wade Baldwin wasn’t particularly well regarded coming out of high school, Damian Jones was a promising project ranked just inside the top 90, and Festus Ezeli was very much a product of his coaching). The biggest variables for his first Panthers team will be how quickly he can have his young point guards ready to compete and how well his wings (and centers) are able to shoot the 3. The Panthers should defend the 3, rebound (although they won’t defend the paint very well), and compete on the offensive boards (one of Young’s strengths), so they should at the very least remain competitive; however, an NCAA appearance is unlikely with the situation at point guard, so a NIT appearance is probably a more realistic goal in a (mostly) loaded ACC. Dec. 29 pre-conference update: The fact that Jamel Artis is playing point guard tells you about all you need to know about how far along Damon Wilson and Justice Kithcart are as point guards. The Panthers have been able to take care of the ball to this point, but the shot selection hasn't been that great. Offensive efficiency seems likely to become more of an issue in conference play, and the team doesn't defend as well as Louisville or Miami. Kevin Stallings did not walk into an ideal situation at point guard, and his tenure will likely get off to an inauspicious beginning as a result. Feb. 3 update: Kevin Stallings made a smart and valiant attempt to take lemons and make lemonade without a point guard by entrusting the offense almost entirely to the dynamic senior duo of Jamel Artis and Michael Young, but there just wasn't enough faux point guard sugar to make it work for the team offensively. What doesn't speak well to Stallings' acclimation to the ACC is that the team doesn't defend well either (266 in FG% defense!, 215 in 3pt.% defense, and 187 in rebound margin) - despite playing with more length than any other team in the conference. With Artis and Young graduating and without a strong incoming class, the Stallings era looks to be getting off to a very sour start (colloquial expression humor, anyone?). 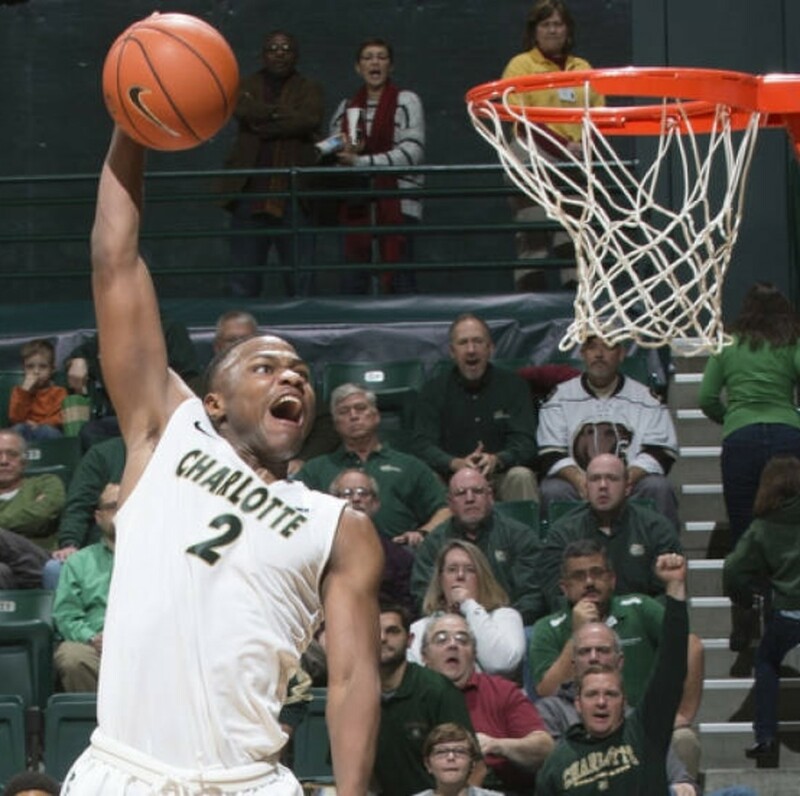 Torin Dorn was part of a mass exodus of very talented Charlotte players that become eligible this season. Departures: Cat Barber (23.5 ppg., 4.6 rpg., 4.5 apg., 36.1% 3pt.) 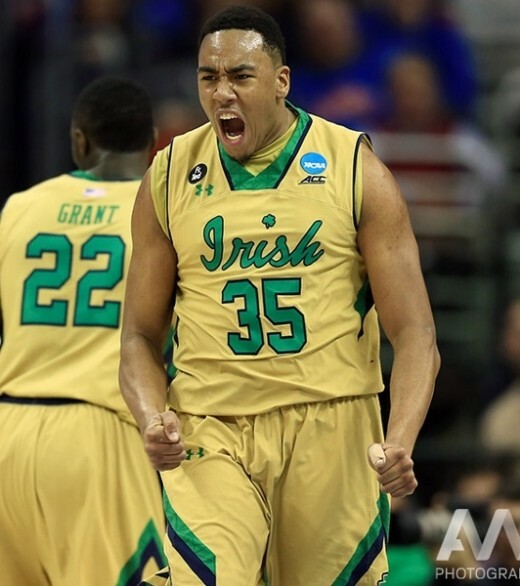 entered the NBA Draft; Caleb Martin (11.5 ppg., 4.7 rpg., 36.1% 3pt.) and Cody Martin (6.0 ppg., 4.4 rpg., 2.3 apg.) transferred to Nevada; Lennard Freeman is a likely medical redshirt. A pair of unexpected departures (Trevor Lacy and Kyle Washington) left the Wolfpack perilously thin going into last season, and an injury to transfer Terry Henderson in the team’s first game paired with Lennard Freeman’s yearlong struggles with a preseason leg injury compounded that lack of depth and relegated the team to a near bottom of the conference finish. The departure of the Martin twins seemingly left the Wolfpack in a similar position heading into this season, but two late additions have changed their outlook substantially. Cat Barber did just about everything for the Wolfpack at the offensive end last season. With Dennis Smith, Mark Gottfried might actually have an upgrade. Smith is a projected top 5 pick in next year’s draft; at 6-3, he’s larger and more physically explosive than Barber, has a similar ability to create his own shot, and he’s a better distributor. After watching the Wolfpack from the bench during the spring, he should already have a good idea of what Gottfried needs him to do. Smith will also have two notable advantages over what Barber was faced with a season ago: he will have a legitimate back up, and he will be flanked by significantly more talent on the wings. A surprise late signee, top 70 recruit Markell Johnson will provide Gottfried with quality depth and a clear heir apparent at point guard. Johnson reclassified from the class of 2017, a move that is becoming more common and has had mixed results (consider Maverick Rowan, Derryck Thornton, and Shaun Kirk last year). Fortunately, he shouldn't have too much pressure on him as a freshman, and he's more mature physically than some of the others that have made the jump (at 6-1 he averaged 7.4 rebounds as a high school junior). At shooting guard, Terry Henderson will finally get his chance to play for the Wolfpack; he hasn’t played in two years following his transfer and a medical redshirt, but he averaged 11.7 points per game and shot 37.6% from 3 the last time he played at West Virginia. Another transfer with a year in the program, 6-6 Torin Dorn, will also compete for minutes after scoring 12 points per game on 50.5% shooting from the field as a freshman at Charlotte. Finally, Maverick Rowan returns after averaging 12.9 points per game and hitting 81 threes on 33.6% shooting when he was supposed to be a high school senior. While he was understandably tentative going to the basket, Rowan was always where he needed to be as a freshman; he should be more mature physically as a sophomore, and that should allow him to be more consistent and aggressive. With Smith, Henderson, and Dorn representing significant upgrades to Barber and the Martin twins athletically, the Wolfpack’s perimeter defense should improve dramatically over last season (they finished 316th in 3pt. percentage defense and 322nd in steals). NC State also adds a potential lottery pick to the frontcourt in five star Turkish import Omer Yurtseven. At 7-0, 230 pounds, Yurtseven is strong and agile and brings an offensive skill level well beyond what the Wolfpack have had in the post since fellow Turkey native Engin Atsur. His ability to score inside and outside will allow the offense to flow much more smoothly than it did a year ago. There is plenty of talent returning as well. Explosive 6-9 junior Abdul-Malik Abu (12.9 ppg., 8.8 rpg.) will compliment Yurtseven perfectly; if his game continues to develop as it did as a sophomore, he could find his way into the first round of next year’s draft as well. Long armed 6-9 senior BeeJay Anya (5.3 rpg., 2.2 bpg.) may return to the bench, but he will continue to be one of the best shot blockers in the conference, and he has also improved as a post scorer. 6-10 Ted Kapita, a third late signee that was a top 80 recruit in 2015 but attended prep school last season, will provide another strong and mobile option. Kapita should be ready to contribute defensively and on the boards right away, and he can also help stretch the floor after hitting 50% of his 3's at prep school. Rebounding was a surprising strength for the Wolfpack last season (they were 56th in rebounding margin) due to a team effort; with bigger, more athletic players everywhere, and a more complete rotation in the post, they could become dominant in that area this year. The Wolfpack will defend better and score more easily than they did a year ago. They have two potential lottery picks for next year’s draft, and they will feature NBA caliber size and athleticism at almost every position. The late additions of Yurtseven and Johnson have more than addressed any concerns about depth, and with them the Wolfpack suddenly have as much talent as anyone in the country. The Final Four could actually be a reasonable goal, and anything short of a Sweet 16 appearance might well be considered a disappointment. Dec. 29 pre-conference update: Just how good the Wolfpack will be is still a giant question mark due to Omer Yurtseven’s suspension, a concussion that kept Maverick Rowan sidelined for several weeks and multiple issues that have kept Ted Kapita off the court. The team struggled to win games early with a limited roster, but has improved significantly at both ends of the court since gaining a full roster. Defensive statistics in particular have been on an upward trend (now up to 89th in field goal % defense, 139th in rebound margin after beginning much lower), with Yurtseven and Kapita making them more mobile and athletic at that end. Beejay Anya has, with one exception, been much less productive as a senior, and could find himself out of the rotation once everyone is available. Offensively, Dennis Smith ( 18.9 ppg., 3.7 rpg., 6.3 apg., 39.7% 3pt.) is on his way to being a top 5 pick, and if Torin Dorn (14.9 ppg., 6.5 rpg., 45.7% 3pt.) continues his torrid shooting pace he could also land on an All-Conference team by the end of the year. This is still likely the second most talented group in the conference, and Mark Gottfried has the team headed in the right direction as conference play begins. Feb. 3 update: NC State is able to compete at times with Herculean efforts from Dennis Smith Jr. (who bears a remarkable resemblance to a better shooting Russell Westbrook from his UCLA days), but there is now a very strong argument to be made that Bobby Lutz was the coaching thread holding things together for the Wolfpack. A team with this much NBA potential should not be heading to the NIT. February 20 update: While the Wolfpack have been one of the biggest disappointments in college basketball this season and clearly have not been ready to compete in an embarrassing number of blowout losses, the midseason firing of Mark Gottfried creates major complications for the program moving forward. After starting what will end as a six year tenure with four NCAA Tournament appearances, including two Sweet 16's, followed by a very understandable injury-marred 13th place ACC finish a year ago, the quick in season hook will effectively make the NC State job a radioactive one. If a new coach can be found relatively quickly and the remaining talent and commits can be kept, that new coach will actually be stepping into a promising situation from a personnel standpoint; however, the unreasonable expectations for the program are likely to keep away the top tier coaches, like Archie Miller and Gregg Marshall, whose names are likely to be batted around by the NC State fan base and administration. Unless the Wolfpack were to, say, lure back Bobby Lutz, a more likely scenario may be an underwhelming hire followed by a few years of mediocrity until expectations can be reset in Raleigh. Gottfried should at least be given credit for going down with the ship; the only other options available would have been to promote another member of the failed coaching staff, none of whom could possibly be considered as the next head coach. Connor Tava probably doesn't want to go out like Dennis Clifford. Departures: Eli Carter (16.0 ppg., 3.9 rpg., 4.0 apg.) and Dennis Clifford (9.9 ppg., 7.3 rpg.) graduated. Sammy Barnes-Thompkins (5.5 ppg., 39.2% 3pt.) transferred to St. John's, Matt Milon (49.4% 3pt.) transferred to William and Mary, and Idy Diallo transferred to UC Riverside. Boston College finished last season without winning a single ACC game (and with a nearly impossible-for-an-ACC-team RPI of 250), and that included a memorably disheartening postseason press conference with an understandably despondent Dennis Clifford. During his five seasons with the program (two with Jim Christian, three with Steve Donahue) the Eagles were a combined 53-107. With one too many surprise defections in the offseason, this year could bring more of the same at BC. Eli Carter's departure may be a blessing in disguise for BC; he came in for one season as the only experienced perimeter player and took the opportunity to fire up as many shots as he could, shooting the ball horribly in the process. His efforts did take pressure off the freshman as they gained experience, but the team will likely become more efficient offensively in his wake. One of the few bright spots for the Eagles was 6-5 Jerome Robinson (11.7 ppg., 4.0 rpg., 3.0 apg. ); while he isn't an explosive athlete, he shoots well and is a capable passer. Robinson will take over at point guard as a sophomore. 6-5 graduate transfer Jordan Chatman, who still has three years of eligibility because of a two year Mormon mission, will likely start by his side despite only earning limited opportunities at BYU. A third sophomore, 6-5 AJ Turner, struggled with his shot as a freshman, but was a four star recruit a year ago that came in with a reputation as a strong shooter. Turner's another capable passer and may have the most upside on the roster; he'll likely have plenty of opportunities as the starting small forward. Athletic senior Garland Owens, a natural small forward at 6-5, 210 pounds, may finally get to play at his natural small forward position after being forced to play power forward for most of his time at the school. The surprising departures of Sammy Barnes-Thompkins and Matt Milon were significant, and that leaves the Eagles shorthanded on the perimeter. 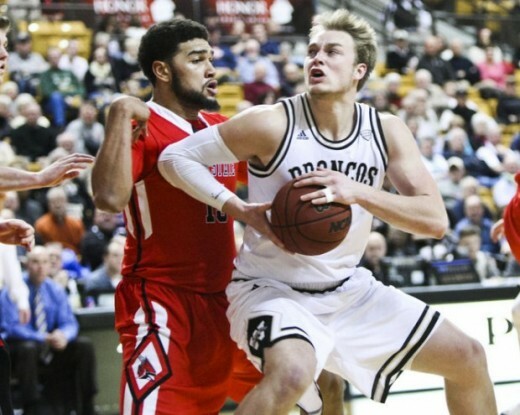 Jim Christian's most impactful addition will likely be graduate transfer Connar Tava, who averaged 12.3 points, 6.2 rebounds, and 3.3 assists at Western Michigan. Although he may be overmatched in ACC play at 6-6, 245 pounds, his passing ability will be an asset at the offensive end. 6-10 redshirt freshman John Carlos Reyes could start at center; he had a promising 11 point, 14 rebound game against an admittedly undersized UMass-Lowell team shortly before a foot injury sidelined him for the year. Christian's other option in the post will be 6-9, 250 pound graduate transfer Maurice Jeffers, who produced 4.8 rebounds and 1.1 blocks in 22.8 minutes at Deleware last season. It's unlikely he'll duplicate those numbers in the ACC, but he should at least produce more than Idy Diallo. Unheralded freshman Nik Popovic will be in frontcourt mix as well. Clifford will be missed, but Reyes, Jeffers and Popovic do offer some potential. Boston College should show some improvement from a season ago. Offensive efficiency should improve along with the rising sophomores on the perimeter and with Tova's passing ability, and the additional big bodies and physically maturing sophomores will help defensively and on the boards. Still, the Eagles are likely facing another basement finish, although they shouldn't hurt the conference as much in nonconference play. With his overall inability to recruit, Jim Christian clearly hasn't been the answer to the question that was asked when Al Skinner was erroneously dismissed. Skinner led the program to 7 NCAA Tournament appearances and 5 NCAA Tournament wins in his last 10 seasons at the school; it looks as though it will be a very long time before BC students and alumni can even begin to imagine that sort of success again. Dec. 24 pre-conference update: Boston College is likely headed towards another basement finish in the ACC, but upset victories against Auburn and Providence give hope that the team will at least be able to pull off an upset for their first ACC win since March 10, 2015. Jerome Robinson (20.5 ppg., 5.2 rpg., 2.1 spg., 39.1% 3pt.) has developed into a legitimate star player and could receive votes for an All-conference team by the end of the year, while freshman Ky Bowman has emerged as the secondary scorer the team badly needed after averaging 18.5 ppg. and shooting 42.9% from behind the arc over the teams last four games (including the two upsets). Feb. 3 Update: Despite a poor record against college basketball's best conference, BC has at the very least become extremely watchable. With the exception of not really being able to help on the boards, the Eagles have as much perimeter talent as anyone in the league with Robinson, Bowman, Turner, and Chapman, and if everyone returns next season it could be the ACC's best. The team is predictably overmatched at the defensive end and on the boards (although they're somehow better there than Pittsburgh), but the offense can keep them in games. Jim Christian may still be gone after the season, but it isn't as cut and dry as it seemed a few months ago. Did the Eagles Just Get a Golden (Tate) Ticket? Upon further review...Sy is going to be forced into action with Blackshear dealing with a stress fracture. I'm certainly aware of Outlaw and Sy at Virginia Tech, but I don't usually include three star freshmen unless there is reason to believe they will be a part of the rotation out of necessity, and of course junior college recruits are very hit and miss (as Virginia Tech saw with Shane Henry, who I had originally been very excited about). Either (or both) of those players could certainly make an impact, but Virginia Tech doesn't really need for them to. Don't forget about Ty Outlaw playing this season for the Hokies. He was the guy Buzz Williams was most excited prior to last season. JUCO transfer who sat out last season with a health issue. They also have a couple of freshmen who could see some decent minutes, including Oak Hill's Khadim Sy at the center position. I'm sure that, as a North Carolina fan, you're aware that Justin Jackson started the first six games of last season at shooting guard when Marcus Paige was injured. That is also where he started as a freshman. Thank you Doug! I completely agree that all of those top 8 teams could be very good. Very well written article. Nice to see someone really do their research. The league will be loaded this year. The difference between 2nd/3rd vs 7th/8th will be miniscule. U do realize that you have North Carolina finishing 7th in the ACC funny thing is they are preseason top ten in the Nation and one of the favorites to win the National Title what a Joke of an article!